Built circa 1670 and formerly a communal bread oven for the nearby properties (no longer in existence) the property was completely renovated and converted (to include all modern amenities including wifi) in 2013 and is now a unique and magical 'gingerbread' cottage. We have renovated the cottage as sympathetically as possible bearing in mind the limitations and restrictions because of the property's age and close proximity to a 13th century chapel. The roof is tiled in the traditional Breton 'reducing' fashion with local slate which we chose from the quarry at Pleven, and each tile is hand-cut and nailed. The exterior of the cottage has been re-pointed with lime mortar and the interior is insulated with sheeps' wool. All wooden doors, windows, shutters and the staircase are bespoke and crafted from local chestnut wood. Regretably the bread oven is no longer functioning (we were worried about the safety aspect) but remains as a decorative feature of the lounge. The cottage is situated in rural countryside and surrounded by green fields, there are no immediate neighbours apart from wildlife including a plethora of birds and a pair of squirrels who play tag in the garden. Relax in the privacy of the lovely little garden (bottle of wine optional! ), take a stroll to the river or canal which are only minutes away or get on our/your bikes and cycle for miles and miles and miles.......you get the picture! We can provide a delightful wicker picnic hamper and blanket and supply you with a delicious picnic lunch (price on application) with your choice of Champagne/wine or cider so that you don't have to worry about finding somewhere to stop for lunch along the way. Our most enthusiastic cycling guests last year attempted to cycle 100k in one day and only just fell short of achieving their target! Can you do better? The Cottage is ideally situated to access all the the Gulf of Morbhian has to offer, be it leave and quiet, sight-seeing or shopping in nearby Rennes, Pontivy or Vannes. Nowhere is more than a short drive in the car or, for the more adventurous, a relaxing bike ride along the canal. Our typical guests like to spend their days getting out and about and then relax in the garden with an apéro (or two) before heading out to dinner at one of the numerous nearby restaurants. Whether your choice is a simple galette or pizza, or a full-on 10 course taster Menu, there’s a restaurant just for you! Prices are much cheaper than the UK too with a simple ‘plat du jour’ (dish of the day) costing as little as €10 at lunchtime! Oh and just one more thing....absolutely no children or other people staying nearby so you don’t have to share the peace and tranquility with anyone else but the birds! We live in Jersey with our two cats and our pugs, we are both aged 50 something and had been travelling to France on our boat for about 10 years when we decided to buy a holiday/potential retirement home. Working hard in busy St Helier, we wanted somewhere to escape but within easy reach of St Malo (the drive is about 90 minutes) so that we could come across after work on a Friday night for the weekend. We both love eating, gardening, cycling and walking and the French way of life in general but we also like keeping busy so we bought a property that required an awful lot of work and have spent the last few years completely renovating the properties both inside and out. Our beautiful one-acre garden was actually a field of sheep when we bought the property but a bit, no make that a lot, of TLC has erased all traces of them. Sandra has since retired and spends a couple of weeks a month in France with the puppies, collecting Paul for long weekends which seem even longer owing to the relaxed pace of life in rural Brittany. We wanted peace and quiet so we picked Lanouee in the Morbihan which benefits from much warmer, (even hot! the temperature in the garden regularly tops 40 degrees) summers than surrounding Brittany. We are only a short distance from such towns as Josselin, Ploermel, Pontivy, Rohan, Malestroit etc but also an easy drive to both Rennes and Vannes with their bustling markets, fabulous restaurants and chic shopping. Situated on an island, the property has the Nantes-Brest canal on one side and the river Oust on the other and thus is ideal for walking, cycling, canoeing etc. In addition there is an abundance of local wildlife so if you're a keen or amateur ornithologist this is definitely the place to 'twitch'! Petite Bourgrimaud is not your usual gite! Built circa 1670 it was a former bread oven so you are unlikely to find another property like it. It has been beautifully restored with a hand-cut, slate roof (from the quarry at Pleven) and traditional lime pointing. It has a wood-burning stove, travertine floors and bespoke doors, windows and staircase made from local chestnut wood. As the only other property on the island is our longere, which we do not rent out, you will experience absolute peace and tranquillity with a complete absence of other people's screaming children! With it's pretty garden, perfect for a BBQ or chilling with a bottle of wine, you are unlikely to want to leave but just in case you do there are two bars (one of which is reputed to serve the best take-away pizzas in the area) within walking distance and a creperie. Read our numerous 5***** for yourself and you'll get a feel for just how magical Petite Bourgrimaud really is. Brand-new bathroom with wc, fully-tiled power shower cubicle and wash-hand basin. Personal towels provided and changed weekly. Additional towels/beach towels available (£10pp) . If you would like a change of hand/bath towels mid-week then please let us know before you are scheduled to arrive so that these can be left out for you. Complimentary toiletries provided. Wood burning stove in the cottage & chiminea in garden. Oil-fired radiator provided in the cooler months. Regrettably we are unable to provide logs which must be obtained from the nearby supermarket. If the owner is onsite a 'service wash' can be provided for a small charge. alternatively there are launderette facilities at both of the nearby supermarkets. A clothes airer, for use in the garden, is provided for your use. Wood-burning stove, sofa and armchair, TV/DVD player (for use with DVDs only, a selection of which are provided, together with books and board-games) Bose sound dock (Bluetooth) for use with mobile phone/MP3. Dining area with table and two stools. All the crockery, cutlery (including steak knives), cooking utensils, BBQ tools, microwave dishes and glassware are provided for your use. 2 bicycles (new in 2019) together with locks and cycle helmets, are provided for your convenience, these are locked in the shed to the right gable end of the main house. There is a private patio area to the cottage and sun loungers are provided for your use. These can be found in the bicycle shed. Brittany has many golf courses so take your pick but the closest is at Duc au Lac a 10 minutes drive away. Notes on accommodation: Please note that there is restricted headroom in the bedroom. Absolutely no smoking in the cottage please and, if smoking outside, please respect the garden and furniture, provide your own ashtray and clean up after yourselves. If there is anything that we have forgotten to mention that you think might make your holiday even more special then please do not hesitate to ask! We are often staying in the main house and are happy to be of assistance, for instance to provide information surrounding the area. No reasonable request refused! Outside: There is a totally private garden with patio, picnic bench, deckchairs, chiminea and BBQ. Regrettably we do not have a swimming pool (working on that one!) but the canal and river are both only a two minute walk away if you fancy a refreshing dip! We provide bicycles, with padlocks, for your use (and can supply you with a delicious picnic lunch) if you don't want to bring your own and a book of trail rides that you can take. There is private parking for one car. Cleaning / Towels / Linen / Maid service: Towels/bedlinen are provided. The cottage is cleaned weekly and always between change-overs but arrangements can be made for more frequent cleaning at extra cost. See above re additional towels.Please leave the cottage in the condition that you found it. lovely, quiet with friendly locals. So glad that you had a lovely time! Sandra really did think of everything from the chilled champagne on arrival to the cosmetic bags, nothing was a problem although away from it all a short bike ride down the canel and we had all we wanted. I’m so glad that you had a lovely time and, hopefully, next time I’ll be there! Short but oh so sweet! This was our second time at the cottage, last year we stayed for a week but this time we got a last minute couple of nights. Just long enough to relax, unwind, get a bit of sun and some cycling ....it felt like much longer! The cottage was just as fabulous as we remembered it, maybe a bit more so as there’s a lovely comfy new sofa to snuggle on. The garden has a lovely ‘English country garden’ feel with tons of lavender and a beautiful pink flowered tree that smelt wonderful, especially when sat on a deckchair breathing it in. Thank you so much for having us back! Wonderful... A little piece of heaven in rural France. Have just returned from the most amazing stay, in this wonderfully restored unique property. If you are looking for a place to stay that has charm, is different, but has all that you need this is the place. The area has lots of options for things to do you will be kept busy, even if it is relaxing in the cottage’s garden thinking about your next glass of wine or what your going to BBQ that evening. Sandra was near by during our stay and was very welcoming and able offer resturant suggestions and local tips. The local church across the bridge is a must see, as is a wander along the canal. I would highly recommend this property and will return. Perfect spot, charming location and just right for 2 people. Sandra is lovely - the perfect host. I very much hope to see you again soon. As we have the Boc-Neuf river on one side and the Nantes Brest canal on the other, the property is ideally situated for walking and cycling (bicycles provided) not to mention canoeing! There are always plenty of fishermen along the towpath or on the bridge so I guess that it's great for fishing too! We are happy to provide you with a picnic lunch (at nominal cost) so that you don't have to interrupt your cycle ride to find somewhere to eat along the towpath, please don't hesitate to ask! We have an enormous amount of wildlife, foxes, squirrels, badger, deer etc though some of them are quite shy so you may hear rather than see them. We also have a wide variety of birds, including woodpeckers and owls, and the swallows regularly enter the house to say hello! There are some fantastic opportunities for keen photographers of wildlife or even the night sky as we have no light pollution whatsoever! The beach at Lac au Duc is a short drive away, which offers many different water sports and a 9 hole golf course, as well as a very safe beach for sunbathing and swimming. Situated approx 72 miles from St Malo; a drive which takes approximately 90 minutes through picturesque, rural countryside. 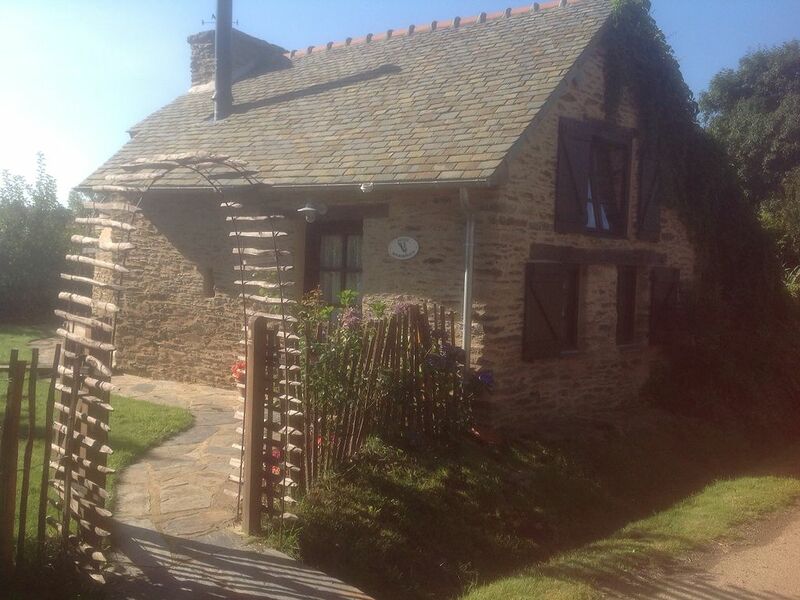 As the cottage is situated in rural Brittany a car is absolutely essential to get to and from the property but it is situated on a 'Voie Verte' (cycle track) and thus there is unlimited cycling so you can leave the car behind, if you so wish, once there. Bicycles are provided for your use. Josselin with it's medieval castle is a 5 minute drive or 30 minute cycle (along the tow-path) away. Ploermel is a 10 minute drive, other nearby towns include Pontivy, Malestroit, La Gacilly etc. Rennes and Vannes are within an hours drive. Both Josselin and Ploermel are busy towns with all the usual amenities (shops, restaurants, banks etc) and weekly markets selling local produce and wares. The French supermarkets of Le Clerc and Super U are both situated within a 5 minute drive and offer a superb range of goods as well as amazing fresh produce. The supermarket at Ploermel sells fantastic shellfish and we have even been able to obtain King Crab legs which were a couple of feet long and tasted superb! Booking Notes: Please contact owner. Full payment is requested at the time of reservation in order to keep administrative costs to a minimum and thus be able to maintain our rental charges as low as possible. We also respectfully ask for a security deposit of £100 (to cover breakages/damage etc) which will be returned at the end of your stay after the cottage has been checked over. In the event of a cancellations we cannot refund so please take out appropriate holiday insurance, in addition an administration fee of £50 will be charged. Changeover Day: Changeover day during the summer season is a Saturday but weekend/mid-week bookings, for a minimum of 3 nights, may be made if the property is available. Check-in from 4pm and departure before 10am please. Please leave the property as you found it. Notes on prices: You will find a bottle of Champagne chilling in the fridge awaiting your arrival but please enquire if you would like us to provide a 'welcome pack' of basics to help you start your holiday, we will be happy to oblige if we are able to do so. Discounts available for 'very last minute' bookings.....please just ask!